Jehu entered into Jezreel and made his way to Jezebel. When Jezebel heard that Jehu is coming, she put shadows on her eyes and decorated her head. They listened to Jehu. 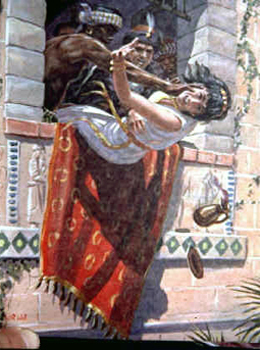 They threw Jezebel out of the window and Jezebel’s blood splattered against the walls and horses. They went to bury the corpse of Jezebel but when they arrive, the dog had already eaten most of her flesh and only the skull and feet and palms are left. Thus what God had said through Elijah the prophet came true that the flesh of Jezebel will be eaten by the dogs at Jezreel. Jezebel is a fiercely independent woman who does not like to submit to anyone. Jezebel would pretend to be submissive when she wants to gain something. Jezebel will never humble herself to anyone. Jezebel’s spirit is a spirit of witchcraft and hatred of man’s dominion authority. Jezebel led the people of Israel astray to worship idols and commit immorality and eat foods that offered as sacrifices to the idols. There is only one way to win the war against the spirit of Jezebel that is we must transformed ourselves to become more and more like Christ.